Robert Elliot’s essay, “Faking Nature,” is one of the classics of environmental ethics, but it is also relevant to philosophy of science. Elliot was interested in cases where corporations want to trash the landscape, but promise that they will put everything back the way it was when they are done extracting whatever resource they are after. To bring this into sharper focus, Elliot imagined the limiting case where the company restores the landscape so that it is qualitatively indistinguishable from what was there before. The restoration, let’s suppose, is perfect. Would the newly restored landscape have the same value as the original? Elliot argued that it would not. The premise that does the heavy lifting in Elliot’s argument is the claim that something’s history makes a difference to its value. I think this claim is true, and that it matters a great deal to our understanding of historical science. Elliot’s argument relies upon a second claim that I am far less sure about. His second claim is about how history matters to the value of a landscape. He argues that human intervention in something’s causal history diminishes the value of that thing. That is why a restored ecosystem would have (he thinks) less value than one exactly like it that came about naturally. I have doubts about this second claim because I think that human impacts upon a landscape, human participation in its history, can sometimes enhance value in strange and unexpected ways. In Connecticut, where I live, there is a long history of human modification of the landscape. For example, behind my house there is an old defunct quarry, a great gash cut across the top of the highest hill in town, appropriately if boringly named “Great Hill.” The landscape today is completely rewilded, but a century and a half ago, it would have been an industrial wasteland, with a small narrow-gauge rail line taking granite blocks down to the Connecticut River, where they would get shipped to Manhattan for building material. Today, the hill is wooded, with dense patches of mountain laurel, and excellent habitat for deer, foxes, turkeys, and even fisher cats. It is only a matter of time before the black bears show up. If you know the history of human impact, the natural beauty that exists today is all the more astounding and poignant. And it’s only enhanced by the boulders with plug-holes left strewn along the hillside by nineteenth century quarry workers, and the section of rusty narrow-gauge rail that only a handful of people on this Earth know where to find. For these reasons, I do not agree that human involvement in something’s history necessarily diminishes that thing’s value. Elliot’s second claim reflects an unmotivated philosophical view that I sometimes think of as “negative anthropocentrism”—the idea that human beings, alone among living things, taint or contaminate whatever they interact with. At the same time, these examples reinforce what I see as Elliot’s deeper and more central philosophical insight—namely, that causal history matters to aesthetic value. Elliot himself uses a different—and quite revealing—thought experiment to drive home the point that history makes a normative aesthetic difference. Compare two paintings: One is the original work of a great master, while the other is the work of a forger with nearly superhuman skills. The two are qualitatively indistinguishable. Not even the most knowledgeable connoisseur can tell the difference. We’d probably want to say that the original artwork has more value than the forgery, even though the forgery might represent an amazing accomplishment in its own right. (It’s not as if art forgery is easy.) The differences in causal history make a difference to the value of the respective works. And the difference isn’t only about the quantity of the value, but about the quality of it: We might admire an exceptional forgery, but not for the same reasons that we’d admire the original creative achievement. There are cases in paleontology that are just like the cases that interested Elliot. In the summer of 2014, the auction house I.M. Chait put an unusual item up for bid. The object (pictured up t the top) is about 6 million years old. It sold for $10.370, a price that included a pretty hefty commission, to a collector who clearly thought that it has some aesthetic value. But what is it? 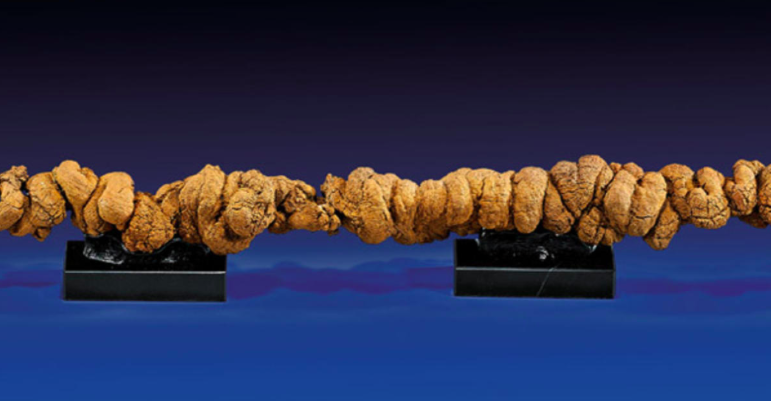 This description emphasizes the item’s aesthetic qualities, and does so on the assumption that it’s a coprolite. For example, if it weren’t a coprolite, it’s not clear that it would make sense to play up the “immense length” or the “unprecedented size.” Our aesthetic appreciation of the object depends on what we think about its history. Indeed, in a more recent interview with Brian Switek, Spencer reports that he’d tried cross-sectioning a number of Wilkes Formation “coprolites” to see if there was any residue from the animal’s last meal, but “never found a dang thing in there.” So there you go. This case is closely analogous to Elliot’s art forgery case: the aesthetic value of an item like the would-be coprolite in this case depends in complex ways on its causal history. Moreover, as we revise our views about the item’s history, we cannot help revising our appreciation of its aesthetic value. If you reflect on a wide variety of other examples from ordinary life, my guess is that you’ll find that we often think that something’s history matters to its value. Exactly how the history matters can vary widely, depending on the example and the circumstances. I want to suggest, in closing, that this insight should change how we think about paleontology, and about historical investigation more broadly. Think again about Spencer’s effort to figure out whether the items from the Wilkes formation are really coprolites. It is tempting to describe that as merely empirical scientific investigation, straightforwardly on the descriptive side of the descriptive/normative gap. But if we accept Elliot’s thesis that history matters to value, it would seem that Spencer’s research was at the very same time an investigation of the aesthetic value of the Wilkes formation “coprolites.” And I think it’s hard to make sense of the coprolite case without accepting Elliot’s thesis. This observation about Spencer’s research might generalize: All efforts to reconstruct evolutionary and geological history would at the same time be investigations of the value(s) of landscapes and fossils. This would yield a surprisingly strong claim about values in science, namely that aesthetic values are typically (maybe always) internal to the practice of historical reconstruction. Elliot, R. 1982. Faking Nature. Inquiry 26(1): 81-93. Spencer, P. 1993. The coprolites that aren’t: The straight poop on specimens from the Miocene of southwestern Washington State. Ichnos 2(3): 231-236. See also G. Mustoe (2001), Enigmatic origin of “ferruginous” coprolites: Evidence from the Miocene Wilkes formation, southwestern Washington. GSA Bulletin 113(6): 673-681.